For some of us, there isn't much more fun than exercising immersed in or surrounded by incredible natural beauty. Last Saturday’s corn snow day at Whiteface was one of those special days, for example, when I didn’t realize I was working hard until I couldn't climb stairs the next day. It was simply so much fun and exhilarating that I didn’t feel at all taxed. I had a similar experience Monday morning at a new yoga class in Lake Placid. Lake Placid yoga teacher, Mimi Frantz, is offering two classes a week at the Lake Placid Lodge, on the lake, Lake Placid. The Lake Placid Lodge, or Lake Placid Manor as it was once known, was one of Lake Placid’s beautiful, old great camp styled resorts before it was lost in a huge fire in 2005. The owners have since rebuilt the resort in the original style, in the same breathe- taking location on the shore of Lake Placid. The Lodge is one of only 30 Relais Chateaux properties in the United States. The Relais Chateaux are some of the finest hotels in the world based on “great character, outstanding cuisine, and unique locations.” Our yoga class took place in a room whose entire north east wall is comprised of windows facing the lake and Whiteface Mountain. It was an Adirondack blue bird day; sunny but crisp, with not a cloud in the sky. We were treated to a wonderful yoga class while watching the rising sun reflect off the still frozen lake and Whiteface Mountain. In my book, that is not a bad way to start the work week. Mim’s yoga classes are excellent, you can work as hard as you like as she will offer variations on all the poses we do based on your wishes. If you like yoga and are in town for a visit, an Ironman training camp or if you live here like I do, these classes are a real treat. We will practice outside once the weather warms up, which will be wonderful. 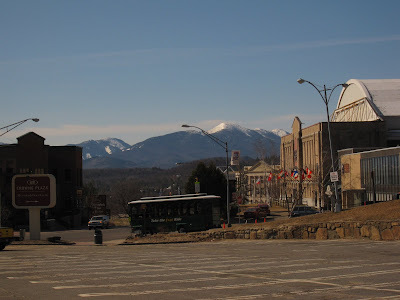 Today's featured photo is the view from Main Street, Lake Placid on Tuesday. Give Me All Your Money, Eh. Are Adirondack Women Forever Wild?! Finally - an Adirondack Buyer's Market! New York Times Loves the Adirondacks!